I know it is a bit late in the month to be posting a July Wishlist but there are a few particular products I am desperate to get my hands on at the moment so I thought I would write about them on my blog in the hopes a certain someone would see this post and treat me – just kidding… or am I.
Jaclyn Hill had done it again. She has collaborated with a fantastic company to create a beautiful product that I just cannot resist purchasing. I already love the formula of the Becca Shimmering Skin Perfectors but the one I own (Rose Gold) is a tad dark for me at the moment, due to me having an English Rose – in other words ghostly pale – complexion. Jaclyn created this product to suit any skin tone. It is described as a soft white gold with pinky peach undertones. It sounds perfect. I believe it is only available from Sephora in the USA at the moment so I will have to buy it the next time I make a Sephora order – which I am thinking will be pretty soon! 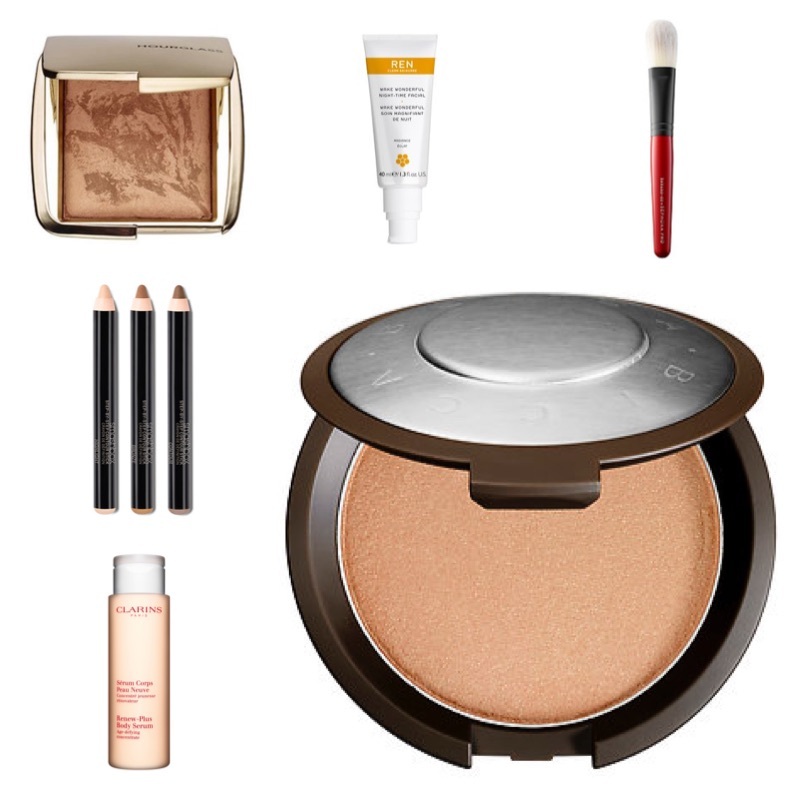 Becca Shimmering Skin Perfector Pressed in Champagne Pop retails for $38 and is available here. I am already huge fan of Hakuho-do brushes. I only own two of them but they are two of my favourite brushes. When I heard Sephora were bringing out a range of brushes created with Hakuho-do it quickly sparked my interest. There are five brushes in the collection and the one I like the look of the most is the Pro Fan Cheek Brush (also called Ougi). Hakuho-do are famous for their fantastic quality natural hair brushes, however, in this collab with Sephora they have designed synthetic bristled brushes. All of the brushes have lacquered red handles with matte black ferrules, they just look stunning. They range in price from $30 – $54 so quite pricey but I am willing to pay that bit more money for a quality brush. The Hakuho-do + Sephora Pro Fan Cheek Brush (Ougi) retails for $40 and is available here. This is not a product I have heard much about in the blogging community but I don’t think I have been disappointed by a Ren product yet. The Wake Wonderful Night-Time Facial claims to work in three stages overnight to leave skin looking more luminous, brighter and more even in tone. I love the Gycolactic Skin Renewal Mask and find that does a great job at making my skin look more luminous in the morning, so this sounds like it may up the glow factor even more. The Ren Wake Wonderful Night-Time Facial retails for £32 and is available here. I have to admit, when this was first released I wasn’t all that fussed about it. Now that I am seeing it being used more and more in tutorials I have fallen in love with the way it makes peoples skin look. It really does give that bronzed goddess look that everyone wants in the summer. I know it is super pricey for a bronzer but bronzing up my face is something I have been enjoying doing recently and none of my bronzers seem to be giving me the look I am going for. Im pretty sure I have £10 of Space NK points so this might accidentally slip into my basket next time I am browsing their site. The Hourglass Ambient Lighting Bronzer in luminous Bronze retails for £42 and is available here. These were added to my wishlist today whilst I was browsing the Smashbox stand in my local Boots. I was on the hunt for their 24 Hour Photo Finish Shadow Primer (review coming next month) and I spotted some testers of these contour sticks. Today was the first time I had seen them in person so I swatched them on the back of my hand and blended them out. I was so impressed with how well they blended into my skin and I am pleased to see that the contour shade is cool enough in tone to actually give the appearance of shadows on the face. The Smashbox Step-By-Step Contour Stick Trio retails for £35 and is available here. This is another recent product want of mine. I was watching Caroline Hirons empties video and she mentioned this as being good for someone with Keratosis Pilaris (chicken skin). I have only just discovered that this is the name for the look of the skin on my arms and thighs, it is something that has bothered me for most of my adult life and is something that causes me a great deal of embarrassment in the summer months – though I’m sure most people don’t notice it. I think I might treat myself to this before my holiday in September to try and reduce the look of the Keratosis Pilaris on my arms. The Clarins Renew-Plus Body Serum retails for £40 and is available here. Have you tried any of these products? If so what do you think of them? Let me know in the comments. In planning on ordering champagne pop for my birthday next month, it looks gorgeous! Ugh, I want some of those ambient lighting powders so bad. I hear they’re supposed to come out with a holiday palette that includes 6 of the colors, so that’ll be awesome!